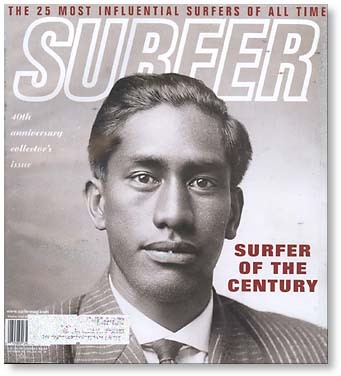 Featuring Duke Kahanamoku on the cover. Press release photo. 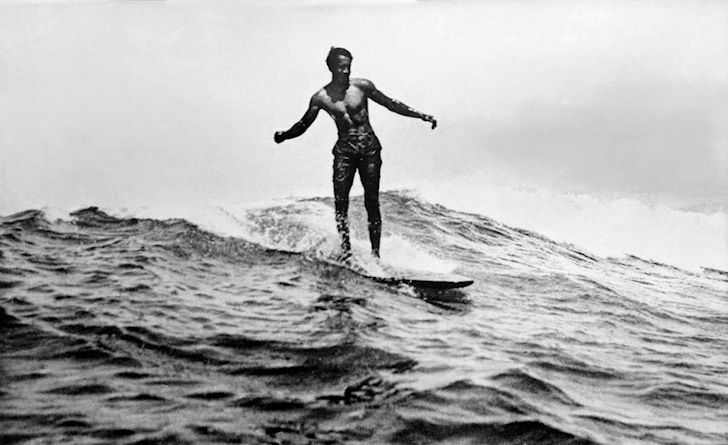 Duke Kahanamoku was born August 24, 1890, in Honolulu, Hawaii, and grew up on Waikiki. His father was a policeman. 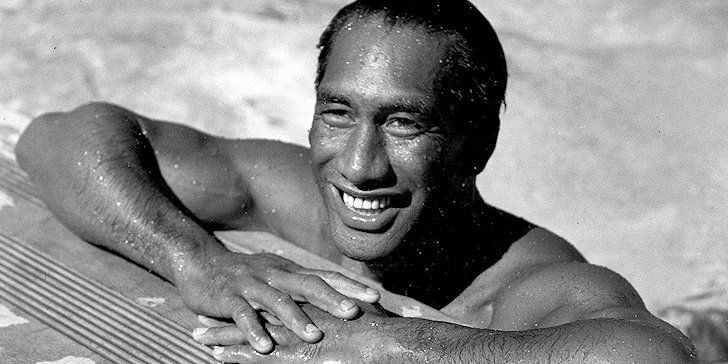 He was the first of nine children of Duke Halapu and Julia Paoa Kahanamoku, according to DukeKahanamoku.com, a website set up to honor his legacy. He was named after his father, who was named by Princess Bernice Pauahi Bishop in honor of the arrival of England’s Duke of Edinburgh to Hawaii in 1869. His family called him by his middle name, Paoa. He Was Known as the ‘King of All Swimmers’ & Shattered World Records in His 20s. Duke Kahanamoku was a strong swimmer from an early age, and in 1911 he broke three freestyle world records in Hawaii’s first-ever AAU swim meet, which was also the first time he swam competitively. He then became an Olympic swimmer, qualifying for the U.S. team in 1912. At the Summer Olympics that year in Stockholm, he won the gold medal in the 100-meter freestyle and the silver medal in the 4×200-meter freestyle relay. He broke the world record in the 100-meter freestyle, using the famous “Kahanamoku Kick,” the Encyclopedia of Surfing says. He won gold medals in the 100-meter freestyle and the relay at the 1920 Summer Olympics and won the silver medal in the 100-meter freestyle at the 1924 Olympics when he was 34. He Pulled 8 Fishermen From the Water in 1925 in a ‘Superhuman Rescue Act’. The “Great Rescue” led to surfboards becoming a common tool for rescue swimmers. Duke Kahanamoku helped push for Hawaii to become a state. He served as the mostly ceremonial sheriff of Honolulu, and welcomed politicians and other dignitaries to the islands, while also bringing Hawaiian culture to the mainland. Kahanamoku was also an actor, appearing in at least 14 films, according to IMDB. Because of his Hawaiian heritage and dark skin, many of his film roles were as foreigners or Native Americans, like “Native Chief” in the 1955 film Mister Roberts, and The Devil-Ape in 1927’s Isle of Sunken Gold. Duke Kahanamoku’s original Australian surfboard…History of the artifact, kept by Claude West….nice video clips of Duke Kahanamoku swimming and surfing from the 20s and 30s; Australia’s Freshwater Surf and Lifesaving Club, Sydney. 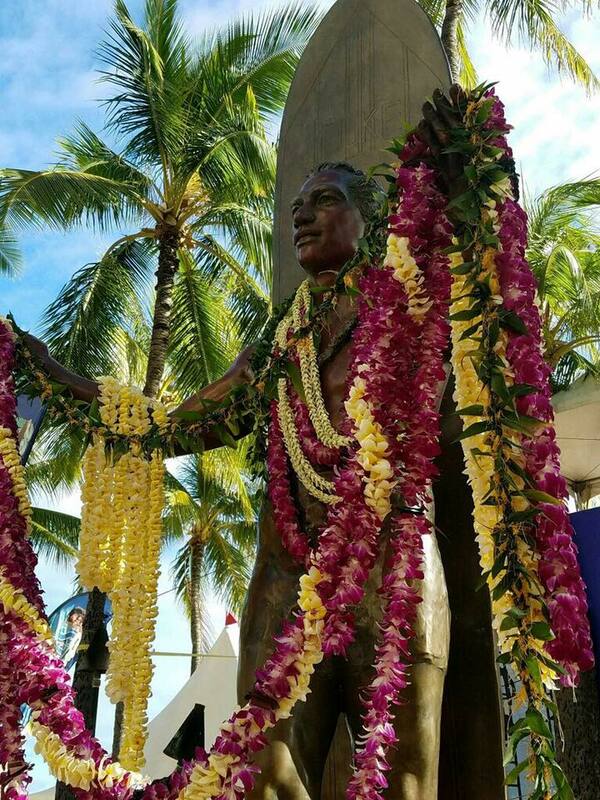 Duke Kahanamoku, who was married to Nadine Alexander in 1940 but did not have any children, has been honored with a bronze statue in Waikiki. He is also in several surfing, swimming and Olympics halls of fame. Many surfing awards and honors bear his name: The Duke Foundation provides grants and scholarships for Hawaiian athletes.